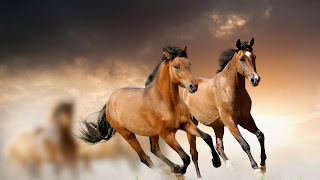 Horse is a domestic animal. Daddy horse is called as 'Stallion'. Mother horse is called as 'Mare'. Baby horse is called as 'Foal'. Horse is a hoofed animal. Horse is a working animal. Horses are in different colour like white, black, brown, grey. Horses drink almost 10 gallons of water per day.